Asian Heritage Foundation (Southern Alberta) is celebrating Canada’s 150th Anniversary! 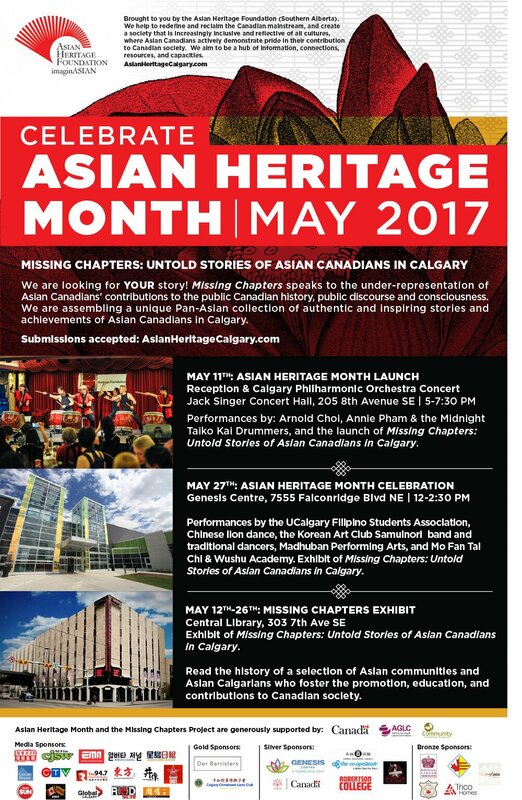 We are looking for 150 stories to share with Calgary through social media and through a printed exhibit to be displayed at various locations through the City during Asian Heritage Month, May 2017. We want to showcase the significant contributions that Canadians of Asian heritage have given to Canada over the past 150 years. We are accepting submissions from a wide range of ages, professional backgrounds, and across all sectors. The contributions can be social, economic, or political. Your story may be selected to appear on social media and at Canada 150 and Asian Heritage Month events throughout 2017. Youth – the future faces of Canadian society. If you have a story to share or know someone’s story that should be shared, please download this form and send it to info@asianheritagecalgary.org. Entries will be reviewed continuously beginning January – May 2017. Please find below some information on Calgary Arts Development’s latest initiative, SpaceFinder Alberta. If your organization has rentable space (rehearsal halls, studios, stages, meeting rooms, boardrooms, gyms etc.) and you are interested in listing your space and its’ availability on our free to list, free to search site, then please contact me for details, or simply log onto the website and start listing your spaces! This online marketplace links organizations with space to rent with those who need space. Calgary Arts Development, in partnership with ArtsBuild Ontario, Fractured Atlas, Alberta Real Estate Foundation and Arts Habitat Edmonton, is bringing SpaceFinder Alberta to Calgary and Edmonton in June 2016. SpaceFinder is a proven technology created and developed by Fractured Atlas, a US non-profit arts service organization. This online marketplace links organizations that have space to rent with those who need space. Our goal is to help organizations (community, volunteer, non-profit, etc.) and venues efficiently find suitable users for their under-used space through this online tool. SpaceFinder Alberta is free to list, free to search. Are You Looking for Space? Calgary venues are now on SpaceFinder Alberta. Head here to look for spaces. Venues throughout Alberta can now be listed on SpaceFinder Alberta. Head here to begin to create listings for the your venue. Contact spaces@calgaryartsdevelopment.com for more information. Many groups in the creative, non-profit and small business communities need space for meeting, creating, rehearsing, presenting, collaborating, gathering or celebrating. They spend considerable resources trying to find suitable and affordable spaces. On the flip side, venues spend significant resources trying to find the right renters for their spaces. These might include commercial renters to cross-subsidize non-profit rentals, or it might be renters who fit the venue’s mandate (e.g., youth and education). SpaceFinder Alberta will strengthen the creative, non-profit and small business sectors with an online marketplace for hourly, daily, weekly and longer-term rentals. From the user’s standpoint, SpaceFinder Alberta will streamline the search for appropriate and affordable space. From the venue’s point of view, it will bring more awareness to the community about your facilities and less space will go under-used. Toronto, June 14, 2016 – OMNI Television announced today that it has filed an application with the CRTC to operate a new national multilingual and multicultural channel called OMNI Regional, the first of its kind in Canada. The national channel would be comprised of four feeds: Pacific, Prairies, and East, which would mirror OMNI’s local stations in those regions, and ICI Quebec, made possible due to a strategic partnership with Montreal ethnic television station International Channel/Canal International (ICI) to serve French-language ethnic communities in the province of Quebec. If approved by the CRTC, OMNI Regional would have priority access to basic TV packages (pursuant to section 9(1)(h) of the Broadcasting Act). Today’s local OMNI stations in Toronto, Edmonton, Calgary, and Vancouver would continue to operate as free over-the-air channels, as would ICI’s local station in Montreal. “We believe our application offers a win-win solution: Canadians get low-cost access to quality news and information programming in their language of comfort no matter where they live, and OMNI and its community and production partners get a stable revenue source that we can use to build a strong and relevant voice for ethnic audiences in Canada,” said Colette Watson, Vice President, Broadcast and TV Operations, Rogers. As part of its proposal, OMNI Television is committing to bringing back four daily newscasts in Italian, Mandarin, Cantonese and Punjabi, making it the only national ethnic programming service in Canada to provide daily newscasts, seven days a week, in multiple languages. “Our new current affairs programming is resonating with local viewers, but we’ve also heard from our community partners, Parliamentarians and the CRTC about the importance of news and information programming to our democracy. If approved, our proposal will allow us to produce both current affairs programming that is locally relevant and news programming that is national in scope,” added Watson. The creation of four regional feeds that comprise the national network will be specifically tailored to ethnic Canadians living in B.C., the Prairies, Eastern Canada and Quebec by including English and French-language ethnic programming as well as third-language programming produced by local independent producers that reside in those regions. OMNI Television expects the CRTC to post its application for public comment shortly. The Board of the Asian Heritage Foundation has decided to POSTPONE our community forum originally scheduled for Thursday, June 16 at Fort Calgary. -we believe our first stage dialogue with individual community should be as broad as possible and we have 2-3 more dialogue / consultation sessions scheduled. -we need additional time to work with a small team of people to synthesis and organize the very extensive and rich information and inputs we have gathered from our discussion with over 12 communities so that we can have a dynamic and efficient discussion when we bring everyone together in August. Meanwhile we are organizing information to share with you about invitations from the Filipino community and Japanese community for your participation and partnership in their upcoming events. And please let us know if you wish AHF to assist in promoting your events between Now to September 2016. To reiterate – there will be NO MEETING on Thursday, June 16. Throughout the months of April and May, 2016, the Asian Heritage Foundation has been consulting with Calgary Asian Communities, as part of our strategic review of the organization’s goals and activities. Please join us on June 16th to find out what we heard through our consultation with over 12 Asian Calgarian communities and start helping us to build our road map for moving forward together. We would like to first thank those of you who took the time to participate in Asian Heritage Foundation’s community dialogue and consultation sessions. Those were enriching conversations as you shared so much with us regarding your community’s needs, accomplishments and activities, as well as hopes and aspirations. We appreciate your feedback on AHF’s new strategic directions. We heard many “shared” interests, needs and challenges ranging from interests for joint programs and need for community space, to the desire to be part of the broad based society to instil pride in community and foster greater cross-cultural awareness. An abundance of ideas were presented for further exploration and discussion on June 16th, including how Asian Canadians can come together to commemorate Canada’s 150th birthday and which broad-based organizations the communities deem important and beneficial to work with collaboratively to enhance social inclusion in Calgary. We will explore the roles of Asian Heritage Foundation to better support the diverse and fast growing Asian Calgarian communities which stand at over 200,000 strong. Together, we can have a stronger voice through collective action. We hope to have you be a part of this voice. Light refreshment will be provided. Parking is free in the Fort Calgary lot. Please RSVP your attendance at this meeting by replying to jdeleeuw@shaw.ca, so that we can keep track of expected numbers.